Looking for a wedding photographer to photograph your wedding on the summit of America's Mountain? We've done just that! This image was taken on the summit of Pikes Peak in Colorado Springs, Colorado! I loved being a part of this adventurous and unique mountain top wedding ceremony. This bride and groom were from out of state, and were traveling to Colorado for some epic mountain scenery as the backdrop for their wedding. They invited family and a couple friends along for the trip, making it a small, intimate wedding. We all boarded the Cog Railway to make the trek up the mountain to the summit of Pikes Peak. 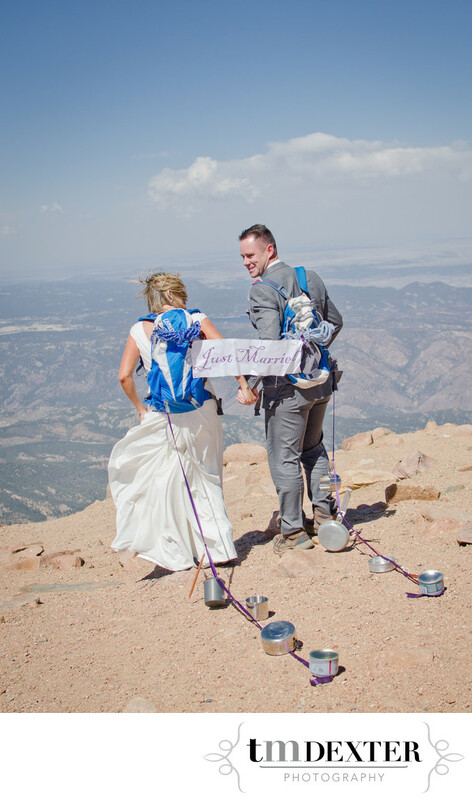 Once at the summit, we choose a spot overlooking the Front Range to the north and the officiant began the ceremony. It was extremely windy, but somehow the bride managed to only wear her wedding dress, no coat! Our hands were freezing while taking pictures with our cameras, but it was totally worth it. Right after the officiant announced the couple as husband and wife, we took a quick family shot and then the newlyweds put on their "Just Married" backpacks and took a trek around the mountain summit for portraits. Since it was so incredibly cold, we all went inside the Pikes Peak gift shop to warm up and take a couple more formal pictures of the bride, groom, and wedding guests. After the train ride back down the mountain, the couple drove to a mountain cabin nearby in Woodland Park for their reception. It was such a fun wedding to be a part of!